That’s the headline on David Kocieniewski’s article on the front page of the business section of this morning’s New York Times. Successful is defined as giving $12.6 billion to 1.8 million taxpayers who have enough income and a high enough credit score in this economy to buy a house. Most of them would have bought that house without the credit, but its very difficult to prove because we’ll never know how many homes would have been purchased if the credit had not been enacted. We do know that the Treasury Inspector General chided the IRS last September for allowing many taxpayers to claim the credit without having to prove they purchased a home. We also know that housing prices have stabilized in many markets where the credit seems to have been used by many purchasers, and we’ll soon find out whether those prices start sliding again when the credit expires at midnight Friday, April 30. I can’t prove it, but I believe the home purchase tax credit just shifted future home purchase to the present and that we’ll see fewer future home purchases in equal proportion. 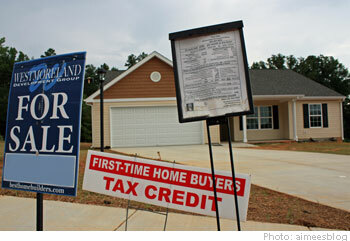 I am biased by my experience formulating the first homebuyer tax credit enacted in 1975. This Urban Institute – Brookings Institution Tax Policy Center assessment and this Center for Budget and Policy Priorities paper express my concerns in more detail. Pete Davis advises Wall Street money managers on Washington policy developments that affect the financial markets. President of his own consulting firm since 1992, Davis Capital Investment Ideas, he draws on 11 years of experience as a Capitol Hill economist with the Joint Committee on Taxation (1974-1981), the Senate Budget Committee (1981-1983), and Senator Robert C. Byrd (1992). He worked in the House and Senate, and for Republicans and Democrats. Davis brought the first computer policy model, the Treasury Individual Income Tax Model, to Capitol Hill in early 1974, when he became a revenue estimator on the Joint Committee on Taxation. He formulated the 1975 rebate, the earned income tax credit, the 1976 estate tax rates, the 1978 marginal tax rates, and the Roth-Kemp tax cut. He left Capitol Hill in 1983 for the Washington Research Office of Prudential-Bache Securities, where he advised investors for seven years. Davis has long written a newsletter on the Washington-Wall Street connection for his clients; Capital Gains and Games is his first foray into the blogosphere. For crying out loud, we are already heading toward a national debt of $14 trillion. Why not allow market forces to place housing at their natural levels and save the taxpayers a bundle? When is the insanity going to end.